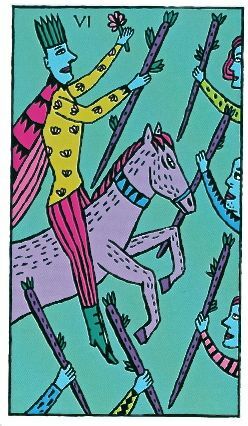 Weekend Reading: Six of Wands from the Kitty Kahane tarot. When you can win without creating losers, you've achieved something special, indeed. So much of life is spent working towards something that we often feel guilty—or frivolous—taking time out to celebrate our victories. But they were long coming and hard won. You deserve every drop of congratulations you can get. So this weekend, revel in your good fortune. And if you're not feeling too victorious, just wait. My week started out less than stellar and ended up yielding one bit of unexpected magic after another. Just because you don't see it coming doesn't mean it's not nearing your doorstep! So why not let it arrive to find you already celebrating?